Telescopic forks come in a variety of styles and dimensions. Fork thickness from 40mm in 5 mm steps. Chain driven to avoid costly repairs if damaged. Oversized drive train for minimal maintenance. Optional 3 and 4 extension profiles for deep reach. Payloads of more than 50 ton on a single fork and customized to suit the type of goods transported. 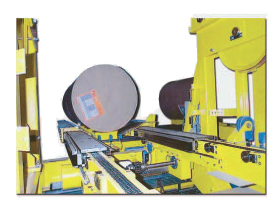 Coil transfer via a single or double fork system. Special supports for different diameter coils. Protective supports for paper roll handling. Complete consoles are also available. 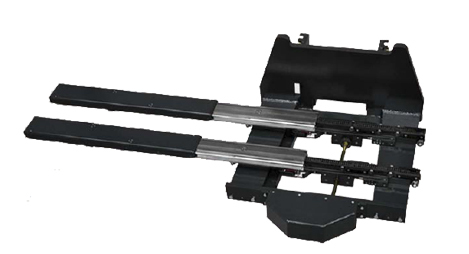 Extreme flat construction for loads up to 1500 kg (3300 lbs) - electric or hydraulically driven for AS/RS and forklift vehicles. Handling devices for loads from 50 lbs to 50 Tons. 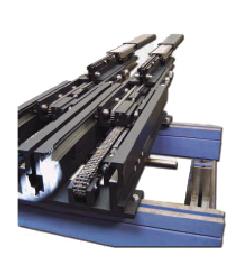 Special telescopic equipment - fork adjustments on one or all forks. Symetrical or asymmetrical movement. 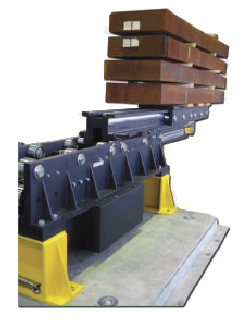 Tilting units for handling loads from gravity and roller conveyors. As well as rotating telescopic fork units.